Meet Our Doctors & Team! Growing up in his father’s dental office, Dr. Ryan Loveless knew from an early age that he wanted to become a dentist. 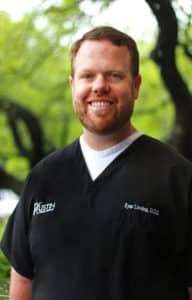 Dr. Ryan obtained his Bachelor in Science from Texas A&M University and attended Dental School at University of Texas Health Science Center in Houston. Dr. Ryan has a real passion for dentistry. He loves to work with both children and adults. His goal is to make every dental experience a pleasant visit. Dr. Ryan feels strongly about keeping up on the latest technology and techniques and devotes his time to current Continuing Education. Over the past several years, he has enjoyed serving his fellow Texans on multiple occasions at dental-based mission trips known as Texas Mission of Mercy. Outside of dentistry, Dr. Ryan is an avid golfer and loves playing the challenging courses that Austin has to offer. However, as crazy as he is about golf, his true obsession is fishing. Whether it is catching a largemouth bass on beautiful Lake Austin or fly fishing for redfish on the pristine Texas coast, Dr. Ryan is a happy man. Dr. Loveless believes in honesty with her patients, explaining every detail of their treatment, listening to questions and concerns, and letting them know when she doesn’t have the answer. In addition to providing comfortable and efficient treatment, she wants to address her patients’ concerns, whether they are emotional, financial, or even related to their busy schedules. She loves hearing about her patients’ lives, and surprising them with how quick and comfortable dental care can be. She enjoys every chance to see the surprise on her patients’ faces when they see their new smile. 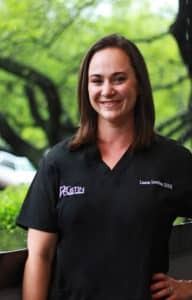 Dr. Loveless earned her Bachelor of Business Administration degree from the University of Texas at Austin, and her Doctor of Dental Surgery from the University of Texas Dental Branch at Houston. 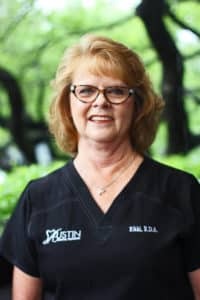 She is certified in general and cosmetic dentistry and is a member of the American Dental Association (ADA), the Texas Dental Association (TDA), and the Capital Area Dental Society (CADS). 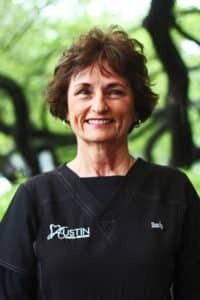 Originally from New Orleans, Dr. Loveless moved to Austin in 2011, and is married to Ryan Loveless, DDS. She has twin boys, Michael and Mile, and a huge extended family she loves visiting. Outside of the office, Dr. Loveless enjoys spending time with her husband and kids, as well as traveling, cooking, reading, and dabbling in amateur photography. Dr. Tom Hassell earned his dental degree from the University of Texas Dental Branch in Houston, Texas. As an undergraduate, he studied architectural engineering and took courses in science at the University of Notre Dame as preparation for his dental education. Dr. Hassell is also committed to continuing education so he can provide his patients the most advanced treatments available. 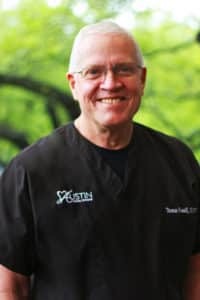 He regularly contributes his dental skill to help the community, and supports the goals of the Volunteer Healthcare Clinic, the St. Louise House, and the Capital Area Dental Society. In 2009, Dr. Hassell became a fellow in the Academy of General Dentistry. Dr. Hassell and his wife, Carol, have five children and seven grandchildren. He stays active as a member of St. Austin’s Catholic Church near the University of Texas. In his free time, Dr. Hassell likes working on home improvement projects and restoring and racing vintage cars. My goal with patient care is to listen, gather information using the newest technology, including digital x-rays, digital cameras with magnification along with visual observation. The goal of a patients recommended treatment plan is to provide or maintain not only the best possible function for the life of the patient, but also the best clean and healthy appearance. The foundation of any plan that might be needed is careful home care using whatever tools are available to reduce the daily deposits of plaque and subsequent tartar that include normal and often damaging levels of bacteria occurring around the teeth resulting in oral disease that can affect overall systemic health if chronic inflammation exists. We constantly strive through continuing education to always be aware of the newest information and technology that can help us to offer the longest lasting repairs when needed. We have restored dental implants since 1986. Our most recent upgrade in technology is the use of computer aided design and milling (cad/cam) techniques to fabricate our tooth restorations. The brand name of this cad/cam system is “CEREC”. This is not new technology to industry, but recent applications using a “Blue Ray” type camera for dental use persuaded us to invest in this modern technology. This camera is used to scan the teeth so that we can custom design the portions of tooth replacement for each person’s needs. The results are not only 2-3 times stronger than other tooth colored restorations of the past, but they are more conservative as well as beautiful. See our photo gallery for more details. Sandy M. has been our front desk coordinator since 1987, and is a University of Kentucky alumni. She is dedicated to providing a positive dental experience to all of our patients, and loves becoming friends with them too. Outside of the office, Sandy enjoys spending time with her children, and playing golf. 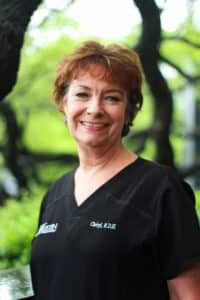 Cheryl graduated from dental hygiene school in Wharton, TX, and has been a hygienist with us since 1988. Her extensive experience has helped her master the art of getting to know her patients, and enjoys learning all about them and their families. Cheryl also volunteers for various charities including the Sealant Program in Austin, TX, the Texas Mission of Mercy Dental Program, and numerous other charity opportunities through her church. Outside of the office, Cheryl especially loves spending time with family and friends enjoying live music, theatre, being outdoors, visiting the beach, traveling, and playing church games. Crystal is a registered dental hygienist, and has been with us since 2012. She received her certification from Taft College in 2007, and holds special certifications in laser dentistry, and in nutrition (particularly its effect on dental health and hygiene). Crystal’s goal is to always make patients feel comfortable and certain that they are in good hands when they visit us. She loves being able to build new relationships and grow with patients, sharing laughs and stories. Though most of Crystal’s family lives in California, where she’s originally from, she loves having them visit her in Texas, usually in their RV. Outside of the office, Crystal enjoys cooking healthy meals, playing tennis, visiting the Movie House and Eatery, spending time with friends and family, and traveling back home to California. 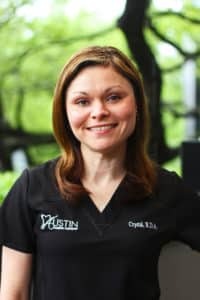 Crystal has been a registered dental assistant with our practice since 2006, and received her certification through Allied Health Careers after graduating from Bastrop High School. Crystal loves learning something new every day, and enjoys hearing the stories and lessons that patients share with her. She is a member of First United Methodist Church. In addition to her work, Crystal also loves spending time with her husband and children, as well as hunting, and partaking in arts and crafts. A registered dental assistant, Rikki joined our practice in 1983. 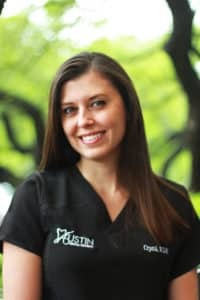 She moved to Austin to attend the University of Texas where she became involved with dentistry and never looked back. Rikki’s favorite part of her job is interacting with patients and making them feel comfortable, while providing a pleasant experience every time they visit us. Rikki loves spending time with her children and five grandchildren (with more on the way), as well as her two dogs and two cats. Taryne joined our team in 2019 and earned her Associate of Applied Science from SUNY Broome Community College. She loves her job, enjoying the opportunity to meet new patients and help them obtain optimal oral health. Taryne’s hobbies include bookbinding, pottery, and calligraphy.